Dental Implants in Mississauga-Are Dental Implants a right fit for me? Most of us are living long and productive lives today, and it is not unusual to lose a tooth or two in this lifetime. Replacing a lost tooth is a complex decision and most people consult with their Mississauga dentistabout options for replacement, and most dentists will usually suggest the three main methods, a fixed dental bridge, a removable partial denture or a dental implant solution; previously a fixed bridge was the most popular solution but dental implants are suddenly the hot topic everywhere! From internet discussion forums to your local coffee shop, dental implants are being discussed passionately. So, what are dental implants and what are they used for? Are they expensive? Will an implant last forever in your mouth? Does it hurt? Is it expensive? Dental Implants in Mississauga are provided by many dentists, and although techniques and brand names may vary, the general path and technique for placing and restoring dental implants remain the same. Although dental implants have historical evidence dating back to ancient civilizations in China, India and the Incas, these implants were usually made of conch shell or ivory or animal bone, and did not last many years or provided functional benefit of today’s titanium implants. Modern dental implants are screw-like root form tapering cylinders that are surgically placed into the jawbone by dentists specially trained in dental implants. Modern titanium dental implants were first used in the early 1950’s by a Swedish orthopaedic surgeon Per Ingmar Branemark, and Dr. Leonard Linkow, who used a flat blade design in the jawbone to which he attached ‘crowns’ that worked fine in the mouth for many years. After many decades of research and fine tuning, most of today’s dental implants are made of titanium metal alloy, shaped like a tapering cylindrical screw, have threads on the surface and are surgically placed in the jawbone where a tooth is to be replaced. After about 3-4 months, bone grows into the screw threads and the implant is then fused to the patient’s living bone, a process termed “osseointegration”. Very few materials on this planet are so biocompatible, titanium is hence unique in this ability. The patient feels no pain or discomfort during the healing phase or afterwards, once the crown is made to fit over the implant. The dental implant is now considered part of the body, a bionic replacement of the missing tooth root. After 3-4 months of healing, the top of the implant is opened and a custom made ‘abutment’ is then screwed on to the head of the implant. This abutment can be made of titanium also or solid zirconia, a biocompatible yet strong alternative, that is tooth colored. The manufacturing of this custom abutment is as important as the final crown. To the abutment is screwed on a custom-made crown that will provide the function and also looks like a tooth. The whole process from surgery to final crown can take about 3-5 months and is relatively painless yet very predictable in success rates. If you are a healthy adult above age 19, and are going to lose a permanent tooth for any reason (wisdom teeth are rarely replaced), say a failed Root Canal, a broken tooth that cannot be salvaged, a tooth with a root fracture, tooth lost due to an accident or injury or if you are a senior with dentures that do not fit well despite all remedies, you should consider dental implants as a solution. Dental implants are usually not placed under age 19, as the jawbone is still growing till that age. 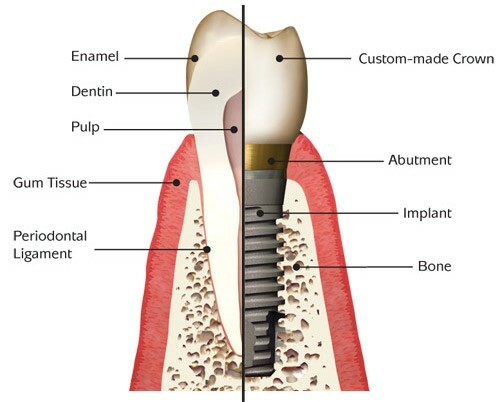 As compared to other options, dental implants are relatively expensive because these are made by specialized processes in high precision manufacturing units where the shape and surface treatment is closely monitored and the implants are supplied to licensed dentists pre-sterile and packaged for surgery. Titanium is a hard metal and although not very rare, it is expensive. Medical grade titanium is usually an alloy of Titanium, with traces of aluminium and Niobium. Recently, zirconium-titanium alloy has been used to manufacture dental implants, and full zirconia dental implants are already being made in Europe. Dental implants are highly biocompatible yet strong enough to withstand chewing forces for many decades. In Mississauga or Toronto, dental implant treatment is usually a 7-8 appointment process spread over 4 months, and is a team approach process. The fees charged by a dental office include the specialized training, case planning, necessary X-rays and planning moulds, dental implant itself, discussion with the dental lab regarding the final crown, clinical fees, facility fees, sterilization fees, cost of disposables, staff fees, lab fees, price of various components that are part of the final crown, taxes, etc. Most patients realize that the cost of the dental implant is due to the fact that it is a long and complex treatment, that gives a very satisfying result when it is over. An initial consultation and X-rays are the first step. Next, the dentist assesses the medical health of the patient, then the actual area of the jawbone to ensure there is enough healthy bone to support a viable implant at the site. Occasionally, if the bone is deficient, a bone grafting procedure may be required to augment the deficiency. The implant surgery is usually done in a dental office under local anesthesia and occasionally antibiotics are prescribed to prevent infection. Stitches are removed 7-10 days later. Monthly checkups and X-rays are done to ensure healing is uneventful. At the end of 3-4 months, when the implant is integrated with the bone, the top of the implant screw is opened and then a special mold made to copy the exact replica of what is in the mouth. From this exact precise mold, working models are made by the dental team which are then used to fabricate a customized abutment and crown assembly which will fit into the implant and provide years of trouble-free service. Although a well-integrated implant in the jawbone may last indefinitely, the abutment and crown that screws onto it undergoes aging like everything else in the mouth, and may need to be replaced, say after 10-20 years or even longer. Regardless, most patients who have had dental implants agree that the process is relatively painless, and the appearance and chewing efficiency of dental implants is closest to that of natural teeth. A payment plan makes it painless on your wallet too! If you feel you or someone you love is a good candidate for a dental implant in Mississauga, please call Applewood Village Dentistry on 905 279 1818 and book your initial consult. Emergency Dental Care at Applewood Village Dentistry in Mississauga. Pain. Swelling. Bleeding. Loose cap(crown) or bridge. Broken denture. Split tooth. If you have any of the above in your mouth, then it is classified as a dental emergency, and we can help. Usually on the same day. Even if you are not a registered patient of our office. We provide emergency dental care during office hours to patients from Mississauga, Oakville, Etobicoke, Brampton and even visiting tourists during the summer months. Call us on 905 279 1818 to schedule an emergency dental appointment. What can you do to help avoid a dental emergency? • Avoid chewing ice cubes. One of the main causes of cracks and fractures in teeth. Olives and cherries will always have pits. Bite hard into one and it often can split a tooth in two. • Use teeth for eating food, nothing else. Buy a corkscrew or a bottle cap-opener to open beer bottles. • Do not use teeth to pry open cans or lobster claws or oyster shells. Use appropriate tools. • Avoid using your mouth to hold roofing nails (roofers) or such is an invitation to visit the ER with serious puncture injuries. • Avoid tongue and lip piercings. A tongue piercing of metal is called a ‘dumb bell’ for a reason. • If you have been informed of a dental problem, get it fixed; waiting till it pains is not a smart idea. • If you ignore a mild toothache, it will get back at you eventually; on a long weekend or after hours, when no dentist is around. 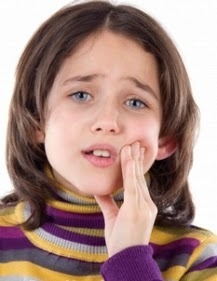 • When your child complains of a toothache, don’t ignore it or postpone calling the dental office. • If you play hockey or football (or kick-boxing or judo, etc. ), wear a dentist-made mouth-guard that fits well. • Use a fluoride-containing toothpaste regularly. • Do not constantly chew gum. Humans, unlike cows and goats, are not meant to ruminate all day. • If you grind your teeth in sleep(or the Hwy-401 during rush hour), get a custom night-guard made. And yes, reduce stress in your life. • Remove your dentures before you take a swim. Fibreglass acrylic dentures, that we usually make, are strong, but will sink to the bottom of the lake. • Learn to care for your mouth and teeth early on in life. We are all living long lives due to modern medical science. Chewing your favourite foods with strong and healthy teeth is one of the few free pleasures of life. • Keep our phone number in your speed dial. Or pick up a fridge magnet. Making dental treatment convenient for patients is part of a program of good patient care. At Applewood Village Dentistry, our office accepts same-day appointments for emergency dental issues and uses a totally digital, paperless system for patient records and patient information storage and organization. This includes high resolution digital X-rays and digital intra-oral camera images. No busy parent wants to tote their children and themselves to multiple offices in order to have everyone’s oral health taken care of. Applewood Village Dentistry has Mississauga dentists that happily welcome all members of your family to their office. Drs. Shukla provide children’s dentistry in Mississauga, so even your little ones can receive routine teeth cleanings and oral exams, alongside you, in one dental office. Part of keeping patients safe and making sure that they are satisfied with their treatment is avoiding the use of silver-mercury amalgam in fillings or crowns. The cosmetic dental treatments provided by Drs. Shukla are made of composites, porcelain or zirconia, and allow your smile to remain naturally beautiful. Mercury-free dental treatment is both biocompatible and patient-friendly! The key to getting your smile and your overall wellness back into shape is communicating your goals to your dentist, so that your treatment fits your needs. A customized treatment plan can include care for dental anxiety, as well as any necessary pre-treatment. Our Mississauga dental team offers a comprehensive cosmetic and general dentistry procedures to fit your needs in any state of oral health. Independently voted Best Dental Office in Mississauga by two different and independent bodies based on votes by count, we at Applewood Village Dentistry don’t take this achievement lightly. We will continue to work hard to gain patient trust, learn and hone new techniques and provide excellent dental care in Mississauga. We are happy to make your search for quality dental care as easy as calling our office for an appointment. Drs. Shukla offer new and existing patients a comfortable and relaxing environment where they can receive treatment from a welcoming team of professionals. To learn more about Applewood Village Dentistry in Mississauga, contact our office today on 905 279 1818, and see the difference for yourself. 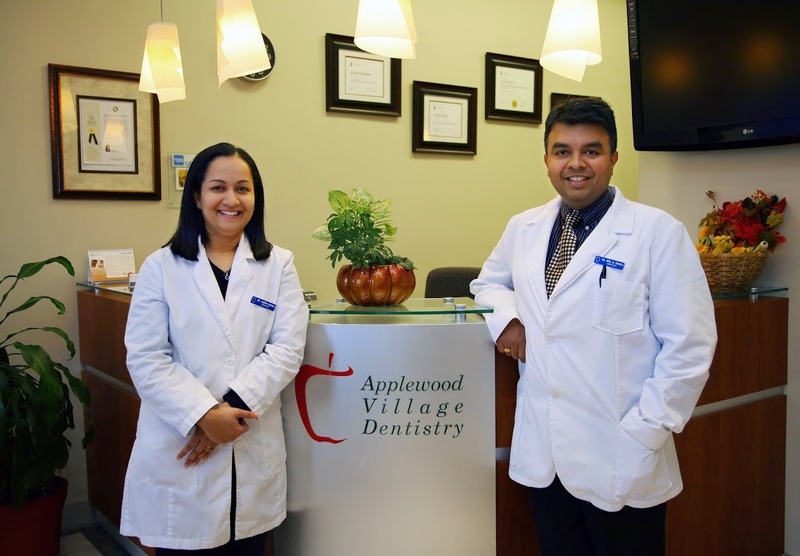 We're excited to announce the official launch of our Applewood Village Dentistry blog. If you would like to stay up to date on the latest from Applewood Village Dentistry, simply click the RSS “Subscribe to feed” link located at the top of the page and subscribe. Our subscribers will be updated when we make a new post.